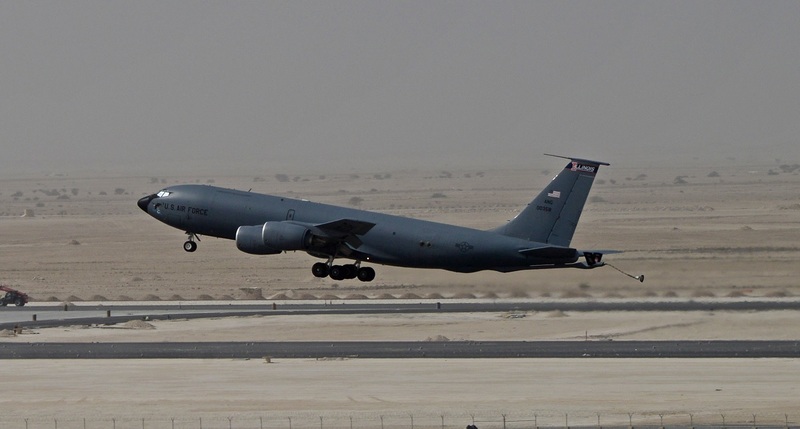 In 1990, KC-135 Stratotankers answered a new call for help during Operation Desert Shield, which marked the beginning of continuous U.S. Air Force (USAF) contingencies for the next 25 years. Even though combat operations had not yet officially began the tankers had to be kept ready to go at a moment’s notice. In fact planning for the coming war was picking up pace. About the middle of Jan., things really began to pick up as the war was about to start. On Jan. 17, 1991 Operation Desert Storm began at shortly after midnight. It would be like this for the next 38 days. It was a terrific pace to keep up. During the war Lieutenant Col. Kevin Sweeney (pilot), Capt. Jay Selanders (co-pilot), Capt. Greg Mermis (navigator), and Senior Master Sgt. Steve Stucky (boom operator) were a KC-135 crew, known as “Balls 13.” Shortly after takeoff they encountered jet wash (the turbulence behind a large aircraft). This unexpectedly pitched them so violently from side-to-side, that somewhere in the process, both engines on the left side of the tanker were torn free, leaving the fully loaded tanker with very serious control problems. In fact, no one had ever encountered this problem outside of a simulator. It took great skill and great cooperation between the crew to save the jet, and since there had never been a successful bailout from a KC-135, quite probably their lives in the process. Just maintaining control of the tanker itself was a tremendous problem, putting maximum strain on the pilots, who had to physically manhandle the tanker to get it to fly. The fuel had to be dumped, a course back to base plotted, and most significantly, gear to be lowered. To accomplish this, Sgt. Stucky had to manually pump the gear down. And with that accomplished, the big tanker landed with no further damage. The crewmembers would each earn a Distinguished Flying Cross (DFC) for their actions that day. Stephen Yavornitzki, former KC-135 boom operator during the time of the conflict, remembered the tankers initially being used to transport cargo, but the mission soon required hours of aerial refueling support as well. 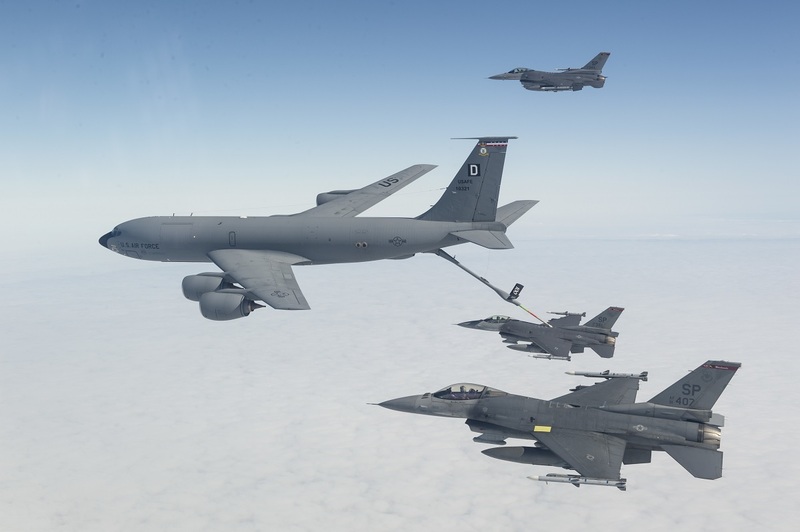 Aerial refueling missions typically lasted about three hours for the boom operator and the rest of his team, during which the aircrew worked to keep aircraft such as the F-16 Fighting Falcon and F-111 Aardvark in the air. The USAF aircraft successfully destroyed key enemy radars, command centers, air defenses and various air fields throughout the region. 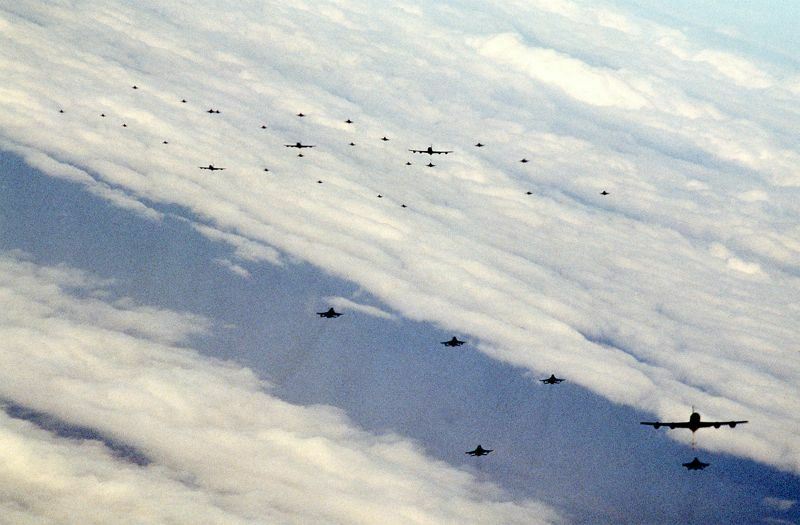 Although these operations were not a direct result of the tankers, the KC-135s were busy keeping other aircraft in the air and enabling them to complete the mission. “The KC-135 was the workhorse, the backbone, of the fight,” said Yavornitzki. According to Air Mobility Command (AMC), over the course of the operation, tankers completed more than 4,900 sorties in 19,700 flying hours. Their crews off-loaded more than 28.2 million gallons of fuel to 14,588 receivers. F-16C Fighting Falcon fighter aircraft of the 363rd Tactical Fighter Wing, Shaw Air Force Base, S.C., are refueled by KC-135 Stratotanker aircraft during the second day of Operation Desert Storm.